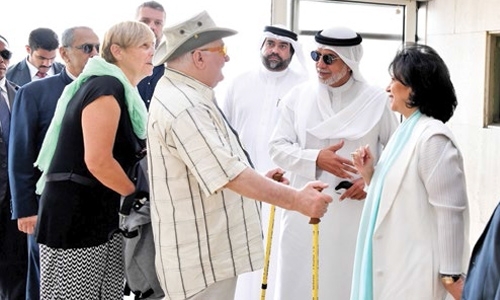 Manama : A delegation of the Nobel Peace Prize laureates, accompanied by Shaikh Hussam bin Isa Al Khalifa, yesterday visited a number of historical places across the Kingdom. The delegation expressed delight in visiting the historical places and heritage houses in Muharraq that reflect the historical significance of the city that deserves more international attention. Former President of East Timor Jose Ramos-Horta, in his speech at a lecture held at the Shaikh Ibrahim bin Mohammed Al Khalifa Centre for Culture and Researches, extended congratulations to HRH Prime Minister Prince Khalifa bin Salman Al Khalifa and the Bahraini government on the development achievements seen in various fields, welcoming the atmosphere of coexistence and tolerance that have made the Bahraini community living in peace and security. He praised HRH the Premier’s vision for promoting peace and stability necessary for development and progress, which also contributed to bringing many successes in various fields, including economic and human development. He reviewed his country’s political, economic and social history and the factors on which he was awarded the Nobel Peace Prize.